A desirable property of a monetary instrument is that it holds its value over short periods of time. Most assets do not have this property: their purchasing power fluctuates greatly at very high frequency. Imagine having gone to work for gold a few weeks ago, only to see the purchasing power of your wages drop by 10% in one day. Imagine having purchased something using Bitcoin, only to watch the purchasing power of your spent Bitcoin rise by 100% the next day. It would be frustrating. I find it interesting to compare the huge price movements in gold and Bitcoin recently, especially since the physical properties of the two objects are so different. That is, gold is a solid metal, while Bitcoin is just an abstract accounting unit (like fiat money). The demand for these objects can fluctuate violently. The implication of  and  is that the purchasing power (or price) of these objects can fluctuate violently and at high frequency. Given , the property , which is the property that gold standard advocates like to emphasize, results in price-level instability. In principle, these wild fluctuations in purchasing power can be mitigated by having an "elastic" money supply, managed by some (private or public) monetary institution. This latter belief is what underlies the establishment of a central bank managing a fiat money system (though there are other ways to achieve the same result). The following graph depicts the rate of return on US money over the past century (the rate of return is actually the inverse of the inflation rate). The US was on and off the gold standard many times in its history. Early on in this sample, the gold standard was abandoned during times of war and re-instituted afterward. 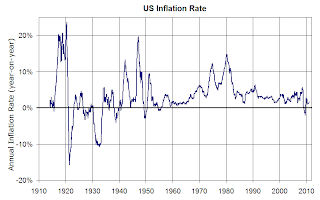 While inflation averaged around zero in the long-run, it was very volatile early in the sample. The U.S. last went off the gold standard in 1971. 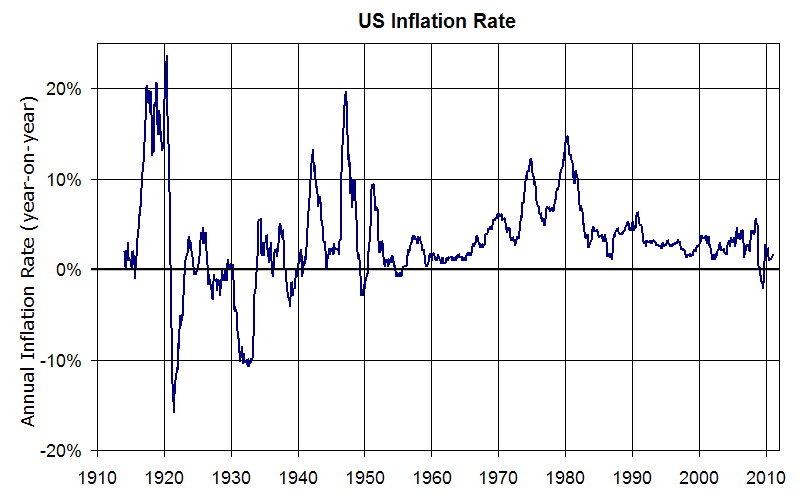 Later on in the sample, we see the great "peacetime inflation," followed by a period of low and stable inflation. Of course, that is the whole point. A gold standard is not a guarantee of anything: it is a promise made "out of thin air" by a government to fix the value of its paper money to a specific quantity of gold. It is possible to create inflation under a gold standard simply by redefining the meaning of a "dollar." For example, in 1933, FDR redefined a dollar to be 1/35th of an ounce of gold (down from the previous 1/20th of an ounce). This simple act devalued the purchasing power of "gold backed money" by almost 60%. If the existence of a gold reserve does not prevent a government from reneging on its promises, then why bother with a gold standard at all? The key issue for any monetary system is credibility of the agencies responsible for managing the economy's money supply in a socially responsible manner. A popular design in many countries is a politically independent central bank, mandated to achieve some measure of price-level stability. And whatever faults one might ascribe to the U.S. Federal Reserve Bank, as the data above shows, since the early 1980s, the Fed has at least managed to keep inflation relatively low and relatively stable. I think gold bugs significantly overstate the gains from "long run price stability." As you mention, in the long-run, you can simply index things against inflation, so what we should care about is not absolute volatility in prices, but volatility around trend. Thus, the fact that the trend inflation rate under the gold standard was 0% compared to a trend of 2% under fiat is not a disadvantage at all. As I note here: http://hyperplanes.blogspot.com/2012/08/john-cochrane-and-gold-standard.html it turns out that short term volatility around trend was actually somewhat higher under the gold standard than over the post-war period. That is, the gold standard was only able to achieve long run stability around 0% inflation by counteracting short-run inflationary episodes with short-run deflationary episodes. For the most part, the fiat currency regime has done nothing more or less than eliminate those deflationary episodes, thereby reducing volatility around trend. Yes, I agree. And to reiterate, the gold standard regime, in itself, places at best weak restrictions on a government intent on inflation-finance. That is because the government can always resort to devaluation or abandon the standard. great info , I really agree with you . 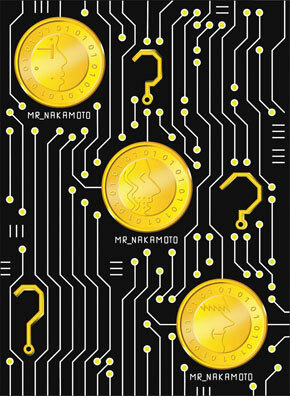 And the latest tech puts actual gold, not just a promise to pay, at the heart of the system. You can try debasing that if you like, seems to me that guys in pointy caps have been trying to do that using lead since the Middle Ages. This is why I tend to 'invest' in things like books, LP's and art. Some appreciate in value, some depreciate in value, but most are relatively easily liquidated if I need money. Until that point, I can use them or enjoy them as I see fit. This blog nails it on bitcoin. Well, if I read you correctly (I have not read the Duy piece), you are suggesting that a slightly higher inflation might be desirable right about now? (Or are you just suggesting that inflation should not be allowed to fall much further below its target 2%?). My own view on the matter is that the economy's problems cannot be fixed with monetary policy (LSAPs). Political and regulatory headwinds are holding back investment and recruitment. That should be the focus. In the mean time, I think the Treasury can safely issue more debt and use the proceeds either to cut taxes or finance public infrastructure. I'm saying that if we want more asset-price stability, we should be willing to tolerate higher consumer inflation (and never give up on full employment). But ultimately I reach the same conclusion as you. I think financial system instability from long-periods of low interest rates makes fiscal alternatives significantly more appealing, especially when there are long-run structural problems to solve. We should never strive for full employment, only full production. Full employment should be a byproduct of full production. In and of itself, full employment is undefinable and unattainable for a number of reasons. George is always a great read. He does not really address the issue of a money supply that is elastic in the short run (he allows for long-run elasticity). Maybe he does not believe that the demand for money is unstable in the short-run? It's funny that most bitcoins critics implicitly buy into the bitcoin bubble by saying that the problem with bitcoins is that it has a deflationary bias due to the fixed money supply. A more serious problem is that there's nothing to prevent the value from falling all the way to zero. I would call that a strong hyperinflation bias. The same problem afflicts proposals to freeze the money base. Freezing the money base would be a hyperinflationary policy, since it amounts to a renunciation of the central bank's promise to support the value of its liabilities. Max, I basically agree with you. Your last point, however, that freezing the monetary base is (potentially) hyperinflationary (a property of all theoretical models fiat money, btw) only holds for a monetary base consisting of fiat money. This hyperinflationary equilibrium is ruled out if the monetary base is a commodity money. "Money is not meant to be a long-term store of value, after all." Currency is not intended as a long term store of value. One of money's properties is a store of value (not sure what makes you think a time limit should be applied to that function), another is a medium of exchange. Gold plays a better role than fiat currencies at the first, fiat currencies a better role than Gold for the second. Truth be told neither Gold or fiat plays the full role of money in the current system. My example above, about buying and selling goods and services at high frequency, is what makes me say that money should have a stable value in the short run. I think currency or anything to be used as a medium of exchange should have a stable value for practical reasons. I do agree with your premise that Gold (& Bitcoin) are a poor medium of exchange in the current environment, but disagree with your use of the term 'money' to describe fiat currency. Gold's performance as a store of value definitely depends on the timeframe, but I don't think comparing it to a stock index is the right way to go about measuring. However on the stock index comparison, was it even possible to buy an index tracking fund 40 years ago? If you'd picked individual stocks then some that were in the S&P500 40 years ago may not even still be around. Other assets Gold has traded in reoccuring ratios against include the DJIA, houses, oil & others. Money tends to have *violent, episodic* volatility in the form of devaluations, bank failures, confiscations, hyperinflations, etc. Markets pour into gold and bitcoin when the risk of that type of event is perceived to be high. It has low volatility as a short term store of value, until it doesn't. I don't know how one can discuss FDR's 60% devaluation and determine that the gold owners got the raw end of that deal instead of the dollar money holders. Those who managed to hold onto their gold made out just fine. Yes, those who manage to hold on to the (purchasing power) of their money/assets will make out just fine. Now, what is to prevent the government from taxing gold (instead of devaluing its gold-backed notes)? A gold standard, even with circulating bullion, does not in itself prevent the confiscation of purchasing power. Did David Andolfatto just inadvertently admit that emitting money is a tax? I think so. Congratulations. Of course the big difference between the inflation tax and a levy on gold, is that the collection of the latter requires government agents who, at times, have to deal with people armed with lead-dispensing devices. So much easier to steal from widows, orphans, and the abject poor, isn't it David? If we lived in a bitcoin world characterized by daily +/-15% price fluctuations, everybody could attain their desired level of price stability by constantly hedging. IOW, financial derivatives would convert a bitcoin world into a stable-value world. The fact that we live in a world characterized by low and steady price changes saves us all from the need to constantly hedge ourselves. We can afford to have a bit of money illusion. You can't have a stable gold price when it's been securitized by etfs and has become just another paper financial instrument -- which has only been the case over the past 10 years. Let gold revert back to a physical market and stop these securitization games and you'll see stability. It is interesting that in the US you have state governments like those in Arizona and Utah reverting to the Wild West, legislating the voluntary acceptance of gold and silver as legal tender. It exemplifies a disconnect between monetary economic fundamentals and a right-wing populist ideology that blindly supports the notion that gold and silver are "better" currencies than fiat money, because, I take it, gold and silver are of a (generally) fixed supply…and perhaps because they are "shiny". What is perhaps more troubling than the fallacy of the argument that gold/silver are better than fiat money is the fact that so many Americans take it as a given that this is so, without bothering to question the premise of the argument or the empirical data. I suppose you can’t really fault the citizenry for it, but it is shocking that some politicians, who are in effect paid to learn about things like economics, and to communicate the rationale behind their policies to the citizenry, prefer instead to “self-preserve” by simply implement policy that does little more than parrot the ridiculous ramblings of the right-wing populists. Have just encountered your page and I guess you should be complimented for this piece. More power to you! I think financial system instability from long-periods of low interest rates makes fiscal alternatives significantly more appealing,but its service is different from other things. NUMBER 7 on the list of 100 top sites for Enlightened Economists. I'm not sure being number 7 on that list is a good thing, given what is number 1. Because central bankers cannot steal real wealth by emitting more of them, and therefore the author of this "article" would not have a salary. Jeesh, I drive off John D and we get this nutjob in his place. Very well, I begin anew -- Tippit, there is a difference between saying something and saying something that makes sense. You have certainly mastered the first, but the second seems hopelessly beyond you. I hope you look forward to my mocking as the only responses to your inane posts. Why gold and bitcoin make lousy money ? They perform well in market or there is any other reason behind that ? . Thank you for the helpful information. I also think that Forexminute.com is a good website, it has very helpful information for trade bitcoins, bitcoin news, breaking forex news, forex trading, commodities news, etc. Great information about gold and bitcoin system. I love your discussion about the characteristics of the 2 element. Gold can go up and down quickly, that's what I learned from trading options. excellent blog post. Keep it up friend. Thank you so much for sharing us. Thanks for your share. It's great. Now ! I want to share my experience when i work with Affiliate Trading Network. I am an expert in marketing cpa industry for over 6 years and I have had a lot of experience with many large networks such as: EWA Private Network, Envyus Media, BLAM Ads Content Locking, Affiliate Trading, AdWork Media, MaxBounty, PeerFly, Convert2Media, Neverblue, Clickbank. All of the networks that I worked, I have never seen a better network than Affiliate Trading Network. I have been working with them for over 2 years and have been paid over 50 times from them. Never had a problem being paid on time or the full amount. I really like working for them and I recommend them to any affiliate marketer. AffiliateTrading.net is a CPA Network with a lot of experience and they are providing you with the support you need. I've been having trouble financial for the past months and I admit it I almost gave up. Then I decided to do Internet Marketing once again, which I haven't done for years. So I started off with different stuffs to make income, and finally came up with CPA, I searched for a good company and read reviews about AffiliateTrading. I Assure you every good things you read about Affiliate Trading Network is REAL. And I have proven that myself. I highly recommend Affiliate Trading Network. Extraordinary website you bang. Do you already stand Bitcoins? I would advocate to signal up at who-accepts-bitcoins.com. They leave create the reciprocation you need as their database is oft searched by bitcoin spenders. It's unloose tho'! They perform well in market or there is any other reason behind that ? . Hi….Thanks for sharing this knowledgeable article about bitcoin currency. Your article is really very helpful for me. Keep sharing more….. Fantastic info and this topics will helpful for us . More over i want to include one more thing here that trade your Bitcoin for OlympicCoin (OLY) on Mintpal, it is so cheap right now. OLY only has 58million coins in total and you can buy 1million of them right now for less than 1BTC... that means in a few weeks the 1million will be easily worth 10BTC! OLY developers are working on new projects - that's all you need to know. REPOST to spread the word. Time for us all to get rich! I agree with you that bitcoin in its current manifestation is insufficient as a currency to be used by the population as a whole as it exhibits undesirable characteristics. However I think the abstract notion of a cryptocurrency can be desirable with some major tweaks. 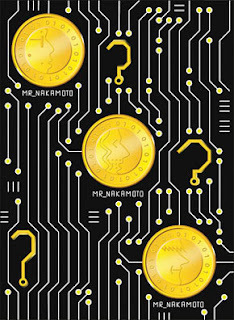 What if we could design a cryptocurrency that was not subject to a fixed supply, but rather grew algorithmically based on indicators that can then influence actions that current central banks use to regulate money supply? This would have to be a function that takes data like economic output, unemployment, (and many many more) and maps them into actions that dynamically change the money supply (i.e. setting the optimal interest rate or reserve requirement). This would also have to be an adaptive process similar to an online learning algorithm that will learn the optimal actions based on seeing the affects of its actions and measuring its success. I am formalizing these ideas further but I feel this blog post is not the best forum to present my ideas in their entirety. That being said I would love any insights you could offer as to potential issues or benefits with this framework. Hello Share your information in blog is informative and greatful .Thanks for share this information. No doubt it will be very useful for my future projects. Would like to see some other posts on the same subject! This is an amazing article totally agree with what the author has said via this article.